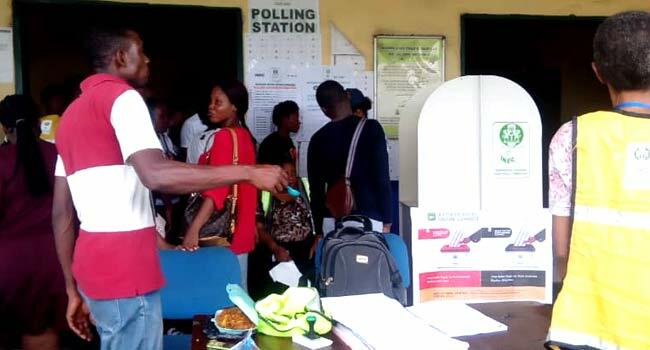 File Photo: A polling station at Rivers state. The African Action Congress (AAC) in Rivers State has condemned the decision of the Independent National Electoral Commission (INEC) to resume the process in the Governorship and House of Assembly elections held on Saturday, March 9, 2019 in the state. The electoral umpire had announced its decision on Friday night, after receiving the report of its investigation committee set up to probe the violence and other electoral infractions that led to the suspension of the poll on Sunday, March 10. But the AAC in a statement on Saturday rejected INEC’s claim “that governorship and state assembly elections results were available for seventeen (17) LGAs”. “Sadly, we are curiously surprised and disappointed that INEC deliberately refused to name the 17 local government areas. “As far as this information is concerned, it is manifestly false and the attempt to shroud the LGAs claimed to have results in secrecy is a serious step by INEC to sway the outcome of the process in favour of Gov. Nyesom Wike, its preferred candidate,” the party stated. In the statement, signed by its Publicity Secretary in the state, Felix William, the AAC asked INEC to declare its candidate winner of the governorship election, saying that “it was glaring that he was winning until INEC stepped in to halt the process apparently to save Wike from an earth-shaking defeat”. However, in its reaction, the Peoples Democratic Party (PDP) in the state welcomed the pronouncement by INEC on the elections “as substantial representation of the true state of the electoral process before the suspension. “However, we wish to draw the INEC’s attention to the fact that in addition to the 17 Local Government Areas with fully collated results, the elections also successfully held and results declared at the unit and ward levels in five of the six other Local Government Areas where full collation of results is still pending,” stated the PDP. It also applauded Nigerian Army authorities for setting up a committee to investigate the alleged involvement of soldiers in the process that led to the suspension of the elections in Rivers State, as well as the alleged assassination attempt on Governor Wike by soldiers.